I am excited to share with you a box that I tried out called Escape the Crate! This box is like an escape room adventure in a box. Each box holds a different game that goes with a different part of history, and it is like going back into the past! The best part about this box is also that you can playwith just about any number of people since it is meant to be a group game. If you love role play type games or escape rooms, then Escape the Crate is quite a treat! Escape-the-room games are one of the fastest growing sensations in America! You are trapped in a room with your friends, family, or co-workers and the only way to escape is by solving riddles, cracking codes, and discovering secret objects. As fun as these are, they are pricey…often close to $100 for a group of 4 for only an hour of entertainment. In addition, once you’ve done one…you can’t do it again. Now you can bring all of the fun of an escape room into your own home…with a different adventure delivered every other month. Imagine escaping from a pirate ship, unraveling alien languages, solving murder mysteries, and defusing time bombs all from your own living room. Work with your friends and family to crack codes, solve riddles, and discover hidden items all while in a beautifully crafted story delivered every other month to you … all for the price of just one person’s ticket at a regular escape room. 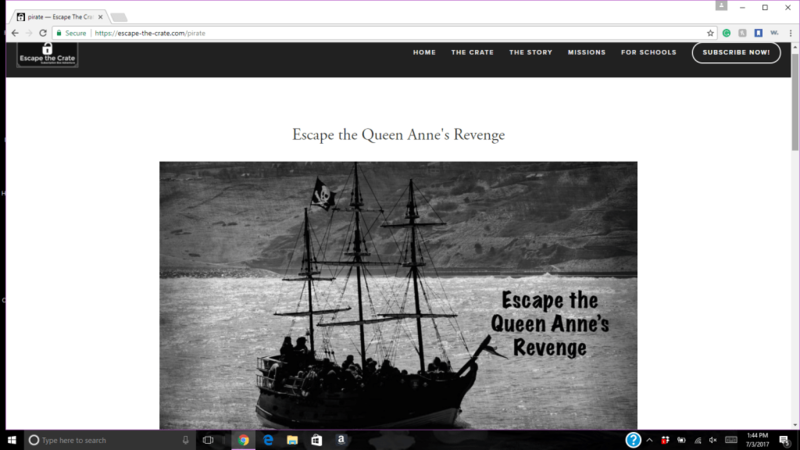 I Received The “Escape The Queen Anne’s Revenge” Box To Review, And I Couldn’t Wait To Try It Out! 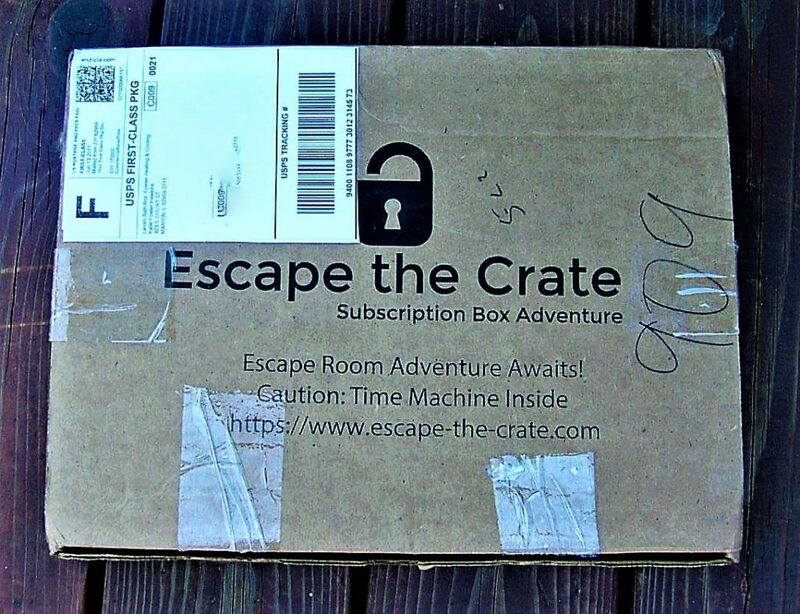 I Love Escape Rooms, And This Subscription Is Just Ingenious. Escape the Crate comes in a simple, flat box. The box holds everything that you need to play the game! I love the caution on the front of the box. The purpose of the game is to take you back in time. 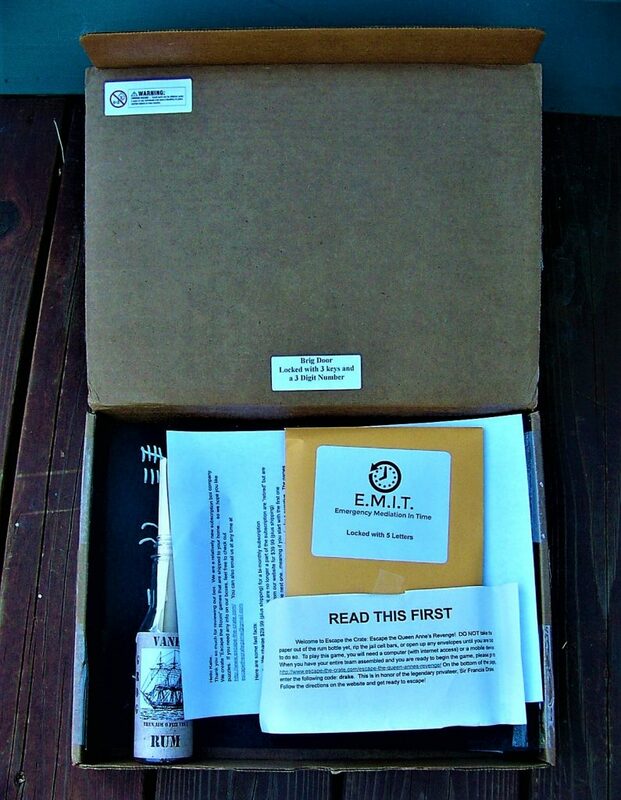 Upon opening the box you are greeted with a letter that tells you not to open any of the items until you solve the different riddles. The letter also has a website that you have to go to play the different games! An internet and mobile device is needed for this. Most of the game takes place online, and you are given riddles to complete so that you can open the different items in the box. Here is the website that I was directed to go to for this specific game! I had to enter a code to be able to access the website. 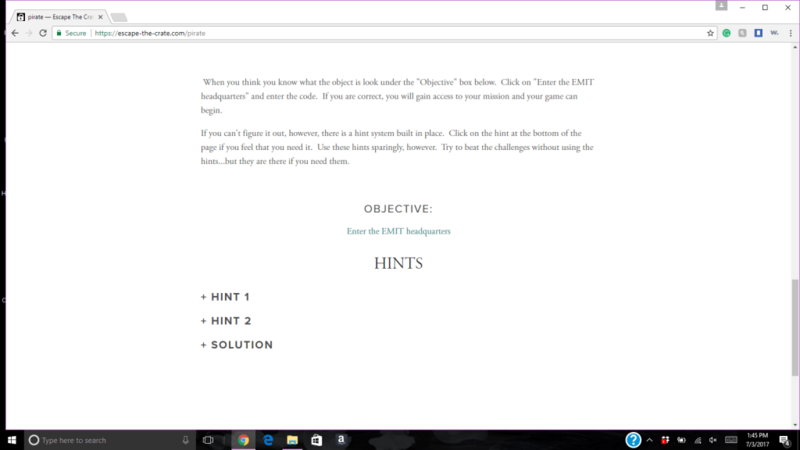 The first page gives you the basic directions for the game, along with your first riddle! There are also hints and a solution given if you need them, but you should try to figure out the riddle before opening these. Once you complete the riddle, you click onto the next page and enter the name of the object that you think the riddle is talking about. That page will tell you if you are correct or not. 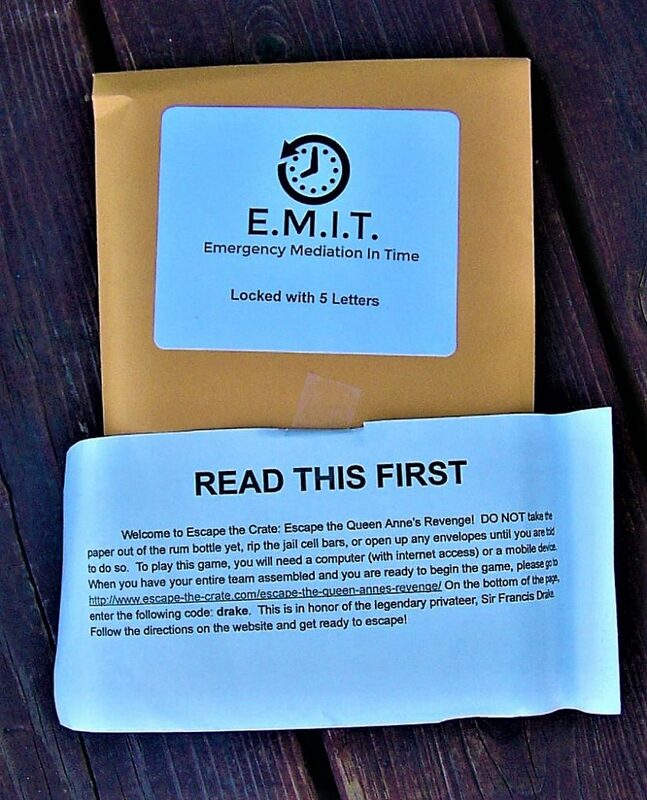 Once you complete the first riddle, you are sent to another screen that instructs you to open the E.M.I.T. packet! 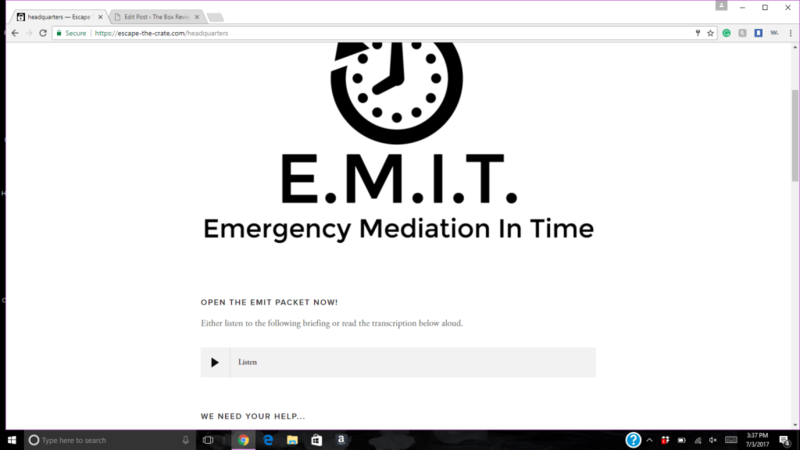 This is the E.M.I.T. packet! In order to open the packet, you had to guess the correct password on the website. Inside of the packet are different puzzles that you have to solve. One of them is to open a trapdoor, another is to open a trunk, and the third is a window that you have to open. Also included is a blacklight and a pirate coin. This packet is your portal to go back in time! 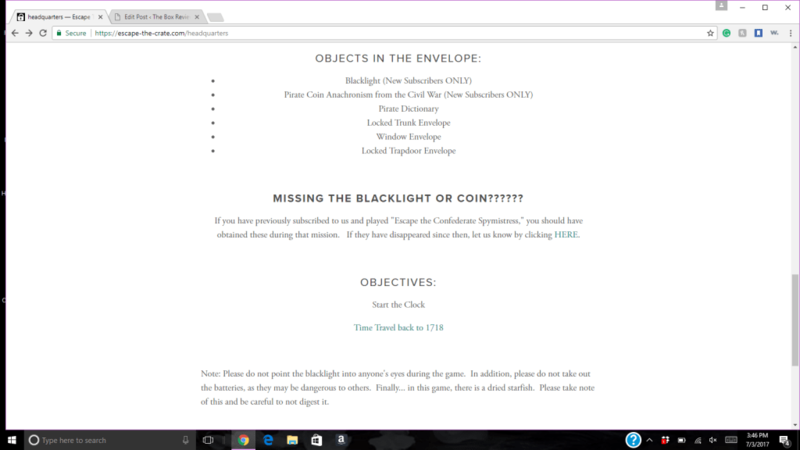 On the website, you have to click “Time Travel Back to 1718” to begin the game! 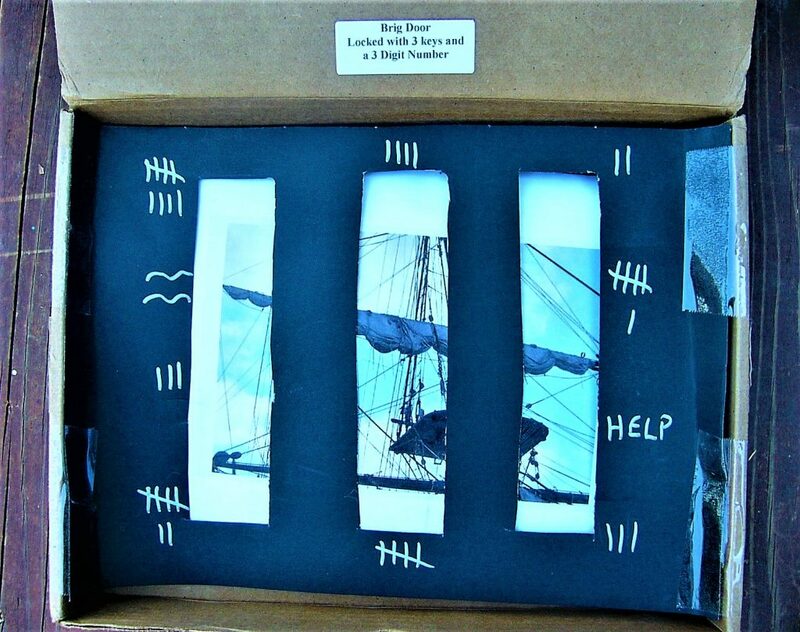 The concept of this specific game is that you are locked in a jail cell on a ship. 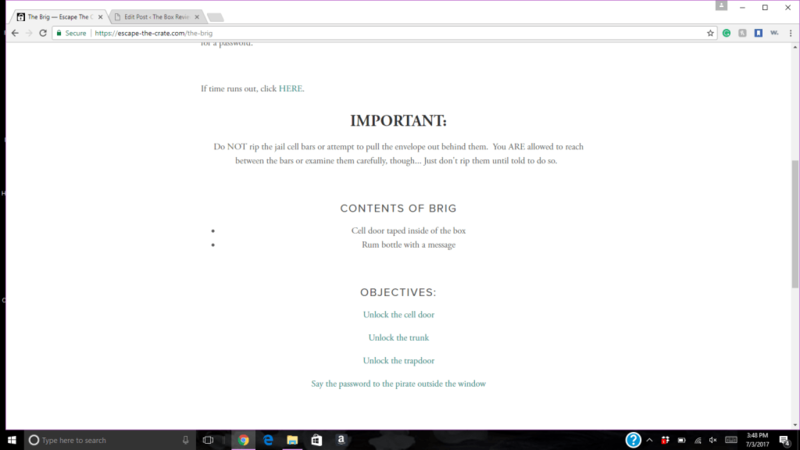 The website gives you objectives, and you have to solve each of the objectives to complete the game and “escape the room”. The bottom of the box physically has a jail cell that you have to escape, and you aren’t allowed to break the bars until told to do so! Even though most of this game takes place online, I love how it still surrounds the concept of escaping the box. Final Thought: Escape the Crate is such an original box! 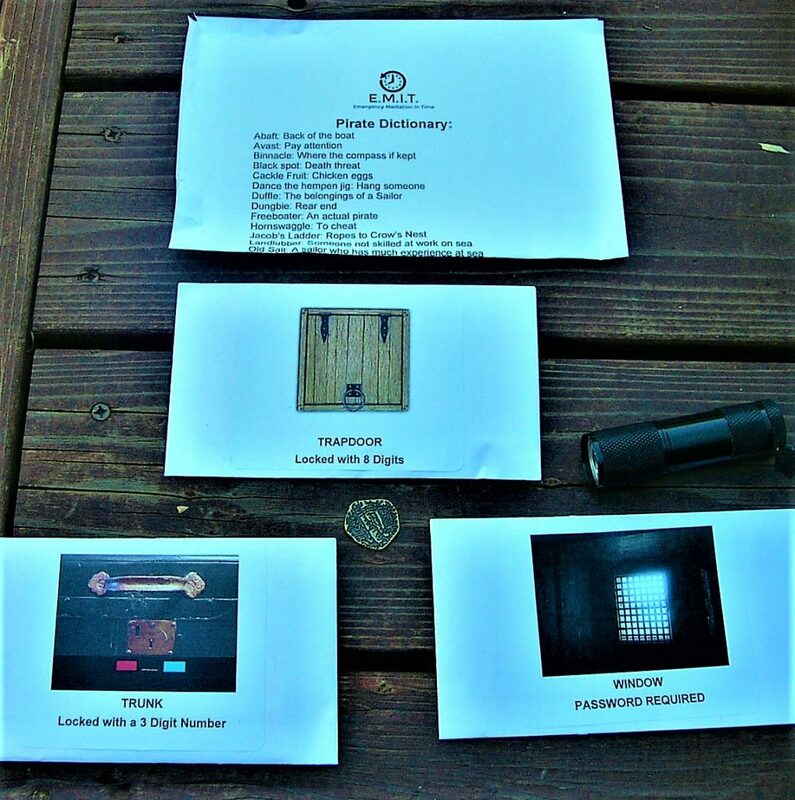 It is so much cheaper than visiting an escape room, and it can be played at home. I also enjoyed how there wasn’t a minimum or maximum amount of players who could play the game. The game does work better the more people you have, but it doesn’t have to be done in a large group. The game was also not too hard or too easy. Some of the riddles stumped my group, so we had a fun time working hard to figure them out! Escape the Crate is perfect for parties, classrooms, or family game nights, and I am so happy to see how much creativity goes into this box. I also love the fact that Escape the Crate teaches you history in a new and inventive way. This box is 100% interactive, and it is the perfect way to connect with others!